1. Preheat a fan-forced oven to 200°C and line two large baking trays with greaseproof paper. 2. 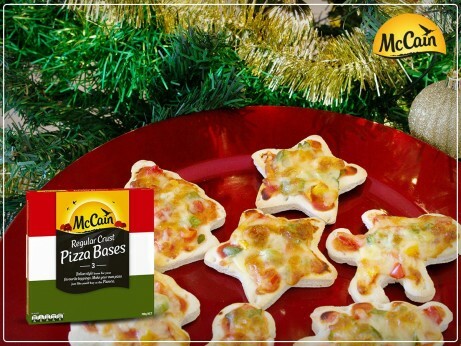 Completely thaw McCain Pizza Bases so they are flexible, and use your cookie cutters to cut the pizza bases into festive shapes. 3. Place pizza bases on the baking trays, spread with pizza sauce, top with your favourite toppings, sprinkle with cheese and bake for 10-15 minutes or until cheese is golden and melted. Serve immediately. 1 Preheat a fan-forced oven to 200°C and line two large baking trays with greaseproof paper. 2 Completely thaw McCain Pizza Bases so they are flexible, and use your cookie cutters to cut the pizza bases into festive shapes. 3 Place pizza bases on the baking trays, spread with pizza sauce, top with your favourite toppings, sprinkle with cheese and bake for 10-15 minutes or until cheese is golden and melted. Serve immediately.